Revo Heritage review | What Hi-Fi? There's a suggestion of the '70s about this Revo's styling, but still, a machine this joyously 21st century deserves a less fusty name than ‘Heritage'. It may look like a bog-standard kitchen/bedside radio, but the Heritage is brimming with features. 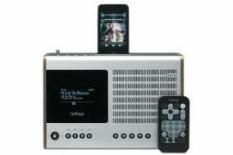 DAB, DAB+ and FM radio reception is joined by wired or wireless internet radio and audio streaming via UPnP. There's an iPod dock integrated into the top panel, and composite video output to deliver iPod pictures or movies to a screen. A USB port allows access to music files stored on a memory stick, and the Heritage can also access Last.fm and its five million-song library. There's even a month's free subscription bundled in. Small, vague joystick navigation apart, ergonomically, the Heritage is pretty well sorted. The display, while far from the most colourful or highest-res around, is bold and distinct, and the remote control, while of the nasty, clicky membrane type, is mercifully low on buttons. This is a mono design, so an expansive sound was never on the menu, and the Heritage is predictably short of low-end purpose. It's an enjoyable, perky and up-front listen otherwise, with plenty of low-fat, high-speed attack, regardless of the source. It's not particularly interested in dealing in the light and shade of a song, but the Revo's engaging and energetic overall signature is a sensible compromise in the context of the product itself. So for full modernity with a National Trust nametag, the Revo Heritage is a diverting proposition.